Do you like Almond Cookies? Here at the Yay! For Food household, we love them because it makes us all nostalgic. Scott likes to say that almond cookies are enjoyed across all cultures. For myself, as a young child, I remember devouring Chinese almond cookies that had a single almond pressed on top. They were crispy on the outside and had a nice golden shine on top from being brushed with a egg wash before being baked. They are usually eaten for Chinese New Year, but I felt that I ate those store-bought almond cookies all year round. Scott remembers going to the local Dutch deli as a child. The deli was loaded with all types of European baked good, but there were a few staples that Scott's parent always purchased. Among these were coconut rings with the paper backing and crispy pretzel-shaped cookies, but Scott's favourite were the soft, almond finger cookies with the single almond half on top. There were relatively few cookies in each package, so you had to quick if you wanted one. So I thought, why not combine some parts of both almond cookies that we most identify with into an easy-to-make one-bowl recipe. It only has six ingredients too! Six ingredients only! The amounts and instructions are listed below. Everything is mixed together in one bowl. I like to use a stand mixer to make these cookies quickly and easily. Scoop out a walnut size (one tablespoon) of dough and flatten it on a baking sheet. Make sure that they are placed at least one inch apart. Lightly press almond pieces on top of the each cookie before baking for 12-15 minutes. 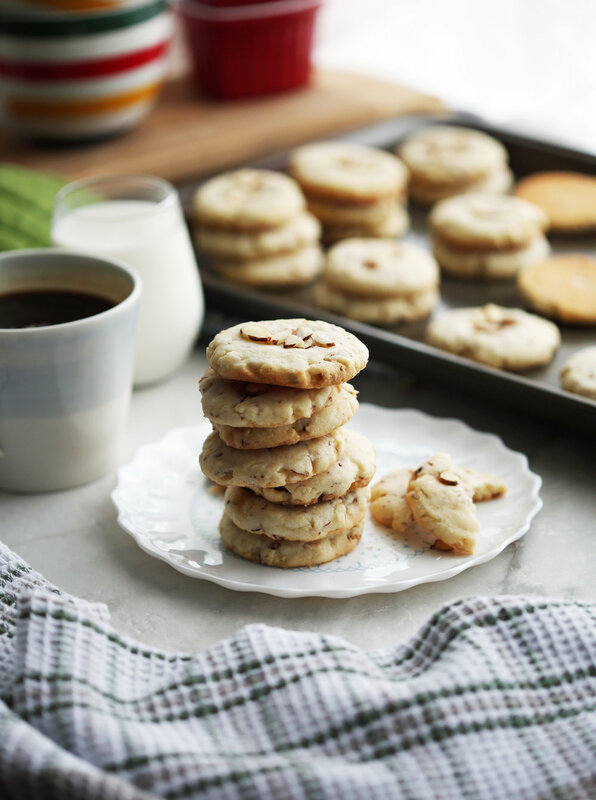 These almond cookies have a wonderful crunch to them, especially on the outside. The insides of the cookie is rich and buttery, a combination of tenderness of the dough and the crunch from the almonds. It’s full of almond flavour from the pure almond extract (so warm and nutty) and slivered almonds in and on top of the cookies. These cookies are amazing right out of the oven (okay, you got to let it cool for a couple minutes so you don’t burn your mouth). 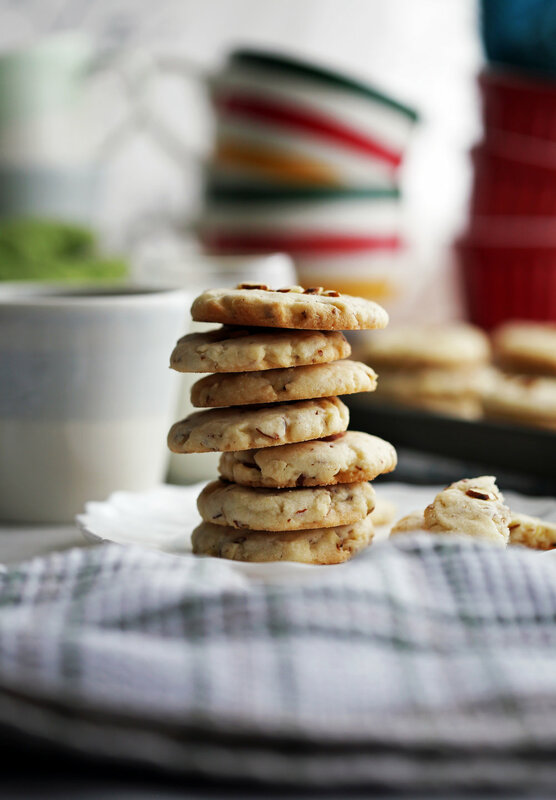 It has a wonderful sweetness that fits so well with the strong almond flavour throughout the cookie. To note, the longer you keep the cookies, the more uniformly crunchy the cookie will get. Of course, the delicious flavour will still be there. Serve these lovely cookies at a party or get-together, make it for a cookie exchange, be the hero at work, or simply save them to snack on all week. I love eating them with a cup of coffee, hot tea, or a glass of milk. I hope you enjoy this recipe! Using an electric or stand mixer, at medium speed, cream together the butter and sugar until fluffy and well-combined. Add egg yolks and almond extract until combined. Gently pour the flour into the mix, scraping down the sides if necessary, until the dough is smooth. Fold in the slivered almonds until just combined. Scoop out a tablespoon of dough and form a ball using the palms of your hands. Place the ball on a large ungreased, non-stick baking sheet. Repeat the process until all the cookies are formed. Make sure that the cookies are at least an inch apart. Flatten each cookie with your hand (or the back of a floured glass tumbler). Press down pieces of slivered almonds onto the top of each cookie. Bake for 12-15 minutes, until the edges and bottoms are golden-brown. Let cool slightly before eating. Store in an airtight container at room temperature or the refrigerator for up to a week.